These dogs were once homeless and have amazing stories. They all now have the loving, forever homes that all dogs dream of and deserve. Thank you to everyone who helped create these happy tails! LIBERTY BELL WAS RESCUED LAST 4TH OF JULY AND FOUND HER NEW HOME JUST IN TIME TO RING IN THE NEW YEAR! CONGRATS BEAUTIFUL GIRL! 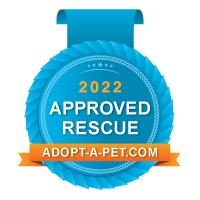 AVA NOW KNOWN AS EVIE FOUND HER PERFECT HOME DIRECTLY THROUGH OUR COURTESY LISTING PROGRAM. SHE CAN NOW FEEL COMFORTABLE, SAFE AND LOVED IN HER FOREVER HOME. OUR LADYBUG WAS RESCUED FROM A HIGH KILL LOS ANGELES SHELTER AND WAS A SCARED AND UNSURE LITTLE GIRL. WE SAW SO MUCH POTENTIAL IN HER AND COULDN’T RESIST HER LITTLE UNDERBITE. SHE MADE SO MUCH PROGRESS IN HER FOSTER HOME AND BECAME QUITE A CONFIDENT AND GOOFY GIRL. SHE KNEW SHE WAS HOME AND SO DID HER FOSTER. SHE BECAME OFFICIALLY ADOPTED THEN AND WILL KNOW SO MUCH LOVE THROUGHOUT HER LIFE! LADY WAS ONCE A STRAY IN THE STREETS OF LOS ANGELES AND KNOW SHE HAS THE GOOD LIFE IN HER FOREVER HOME!